This evening we ate a spinach salad with strawberries and toasted hazelnuts, all from our very own yard. Yesterday I thinned the spinach and salad greens again, and came away with a bowl full of greens. The front yard strawberries are ripening. 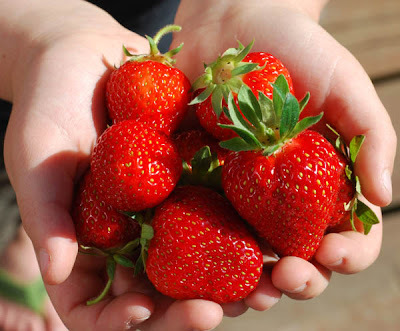 We ate a bowlful of fresh strawberries with breakfast this morning, and I picked another large handful for the salad this afternoon. Last fall, loving husband raked up the hazelnuts from the filbert tree in the back yard and shelled a bucketful, so there are hazelnuts in the pantry for toasting. Put clean fresh spinach in a bowl. Toss with sliced strawberries and toasted hazelnuts. Serve with a balsamic vinagrette. Yummy! They look so beautiful too. Those are some of the biggest, juiciest, prettiest strawberries, ever!!! or maybe it's just those cute little hands holding them! The salad sounds delightful and I also love the wordless Wednesday pic from last week!!!!! Sounds so yummy. I agree, goat cheese would be wonderful. We have spinach and lettuce just starting to come up. Beautiful photo.